We haven’t heard from Troy Schafer (Kinit Her, Wreathes, Rain drinkers, Devotion, to name a few) for a while, but it would be ignorant of us to assume that Schafer has been relaxing at home and watching the grass grow. He might have done that, but he was also working on several music works, one of which is this album. Essentially, “Survey of a Broken Tape Recorder” sounds like a grinding machine grinding itself elusively, only to the eyes of Mr. Schafer. This is an intimate moment between the artist and the machine, and we get to hear the results, which are not strictly ‘lab results’ as much as they are an organic channeling of the spirit from the machine. And what exactly do we hear? This exorcism produces a piercing drone that lets the first track penetrate the mind, violently blooming magnificent flowers in remote corners of the mind. The sound disruptions, especially on the second track, begin to behave more like exotic means of communication, and you, the listener, can only absorb this sublime wave to a limit. This is where Schafer is testing you and your mental discipline. Part three, the great opus of 30 minutes, changes shapes and shifts like an unstable current. This new challenge to the mind of the listener produces surprising turns and stops through the astral stream of signals. Schafer evacuates the distress signals and orchestrates a swansong for the small device. 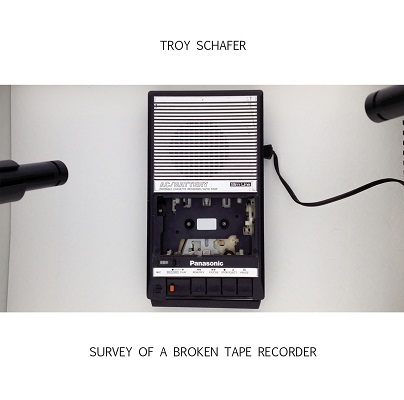 This is just a broken tape recorder, but if you close your eyes and dream for 45 minutes, Troy Schafer will make a monster out of it for you.